As 2017 winds down, it is time to forecast the workplace technology trends for 2018 and anticipate how these trends can impact your small business. We are in the business of making sure you are prepared for what the changing technology environment will throw your way. One of the biggest trends is Bring Your Own Device, or BYOD. These policies allow employees to use their own laptops, tablets and smartphones for work, accessing shared files through the cloud. What are the benefits of this kind of system for your business? Your team may not be in the office from 9-5 Monday-Friday (remote work and telecommuting is another big 2018 workplace trend). There are many benefits to BYOD policies. Switching between devices leaves additional room for errors and inconveniences that could result in lost productivity, such as leaving an important document saved on the office desktop and being unable to access it over the weekend. When your employees are using their own devices, instead of switching from one device for work and using another at home, it is less likely they will be able to access the files when they need them, increasing their ability to be productive. There is also cost saving element associated with this type of policy as your company does not have to shoulder the burden of purchasing hardware. Employees may even like being allowed to use their own preferred devices. After all, as so many people already own a smartphone, providing a company cell phone may be unnecessary, even cumbersome as users need to switch between their work and personal mobile devices. Instead of buying a laptop when you onboard a new employee, you may only need to purchase supplemental software like Photoshop and antivirus solutions. Having company-purchased software like the Adobe Creative Suite that they may not otherwise access can be an additional perk of the job, improving your relationship with your employees. They also get to use the devices with which they are most comfortable or familiar, instead of being a Mac user at home who must adjust to a PC at the office, or vice versa. In many ways, the policy seems like a win for everyone involved, but BYOD workplaces also have their share of risks. Your employees are not all going to be IT professionals, and that means that BYOD policies leave more room for user error and security risks than if every worker is using devices selected and maintained by your IT department. You will need to set specific security policies, and look at providing a secure network for your employees to access from home, rather than accessing unsecured WIFI networks. When you implement a BYOD policy, you necessarily give up a level of control. When an employee leaves that device goes with them, and with it, potentially sensitive information like company passwords. There are many reasons that BYOD policies are becoming more and more common, but is it right for your company? We have outlined some of the general productivity, cost and convenience considerations. We can also help you assess the costs and benefits of a BYOD policy for your unique business, and create a cybersecurity strategy for you. Don’t worry about figuring it out on your own; contact Ontech Systems, Inc. today! The bring your own device (BYOD) trend has significantly grown over the past 5 years – and it’s no wonder. According to Fliplet, businesses gain a whopping 240 extra hours of work per year when they implement BYOD in the workplace. That’s the equivalent of $5,114 in extra work or 6 additional working weeks – per employee! When children born today enter the workforce, it’s very possible the idea of a company owned device will be completely foreign to them. The days of investing thousands of dollars in the clunky hardware your parents grew up with are numbered. A revolution in mobility is not coming – it’s already here! A Cisco study revealed that 69% of IT decision makers in the U.S. feel this trend is a positive move for their organization. Whether you’re intimidated by the concept or still hanging onto the “good ol’ days” of traditional desktop computers, check out these surprising statistics. Regardless of how you feel, they’ll give you a unique look at the trending workplace of today – and into the future. It’s no secret an increasing number of people are ditching their old PC’s in favor of mobile devices. The moment this mobile trend began trickling into the workplace, it forever changed the way we work. As you read these statistics, you’ll see why BYOD not going away anytime soon. When businesses adopt BYOD into their workplace, productivity soars! 49% of employees say they are more productive using their own devices. If you’re concerned about security in your mobile workplace, you should be. Check out these starting statistics about the risks of BYOD. While BYOD does have risks, the benefits far outweigh the risks. In addition, if you integrate a mobile device management (MDM) solution into your business, you can experience all the benefits of BYOD, with none of the risks. The #1 weakest security risk for businesses is mobile devices. Since BYOD is still a “relatively” new concept for employers, there are an abundance of security gaps, risks and oversights throughout organizations of all sizes. Imagine a workplace where there is no BYOD policy, yet employees’ phones contain access sensitive business data. In this workplace, employees are free to install any app they want, regardless of how safe it is. If the device is lost or stolen, the employer has no way to retrieve or remotely wipe the data – it’s just gone. And when employee resign? You guessed it – they take the sensitive business data with them. If the #1 weakest security risk for businesses is mobile devices, it’s no wonder hackers are targeting businesses. These statistics showcase the “Wild West” of BYOD that is still very alive today. BYOD is Largely Unmanaged: 80% of all BYOD is completely unmanaged. If you don’t want to expose your business to the inherent risk of BYOD, consider a mobile device management solution. Our techs are highly qualified and experienced in the BYOD space and mobile device management. We can handle all the details and help you make your workplace BYOD-friendly, while keeping security threats out of your business. Are Zombie Phones Draining Your Mobile Budget? Halloween is just around the corner. Want to hear something scary? If your organization has policies in place that allow former employees to keep their mobile phone after they leave, zombie phones could be attacking your mobile budget – and you have no idea it’s happening! 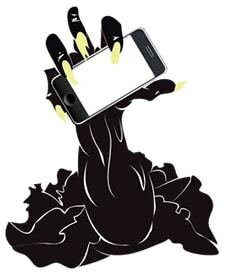 “Zombie phone” is a term coined by Amtel, a MDM vendor who, while analyzing companies’ mobile networks, discovered that a certain percentage of phones were still alive, when the company thought they had been disconnected. Many organizations now implement a BYOD (bring-your-own-device) policy and as employee-owned devices replace company-owned mobile devices; an estimated 10% of the time, the carrier continues to bill the company each month, due to lack of monitoring from the customer and oversight on behalf of the carrier. Amtel says that zombie phones are almost certainly draining your mobile budget for if your organization has between 500-50,000 mobile lines. Just what kind of budget drain are we talking? While auditing a large multinational biotech company, Amtel discovered 2% consisted of zombie phones that were costing the company $70,000 annually. In the world of BYOD, former employees are often asked to take over liability and payment of their corporate-issued phone, once the bill is transferred to their name. This transfer is a tedious process, requiring a lot of back and forth phone calls with the carrier. 10% of the time, the transfer does not go through. As a result, the company continues to pay for the phone month after month, while the former employee continues to use the phone – free of charge. What’s worse, if the employee was receiving stipends from the company as an incentive to get some measure of control over the device, the company unknowingly pays double for the phone each month. Here’s another common scenario. When an employee leaves a company, they turn in their company-issued mobile device. The company then notifies the carrier that they want to terminate the contract for that particular phone. The phone is stored away, never to be seen again. What the company does not realize is that 10% of the time, the phone plan is NOT terminated, remains unnoticed by IT and billing and the zombie phone continues to drain the company’s mobile budget month after month. The only foolproof way to prevent zombie phones from slipping between the cracks is with a Mobile Device Management (MDM) solution. This service makes the process of checking each device to ensure it is in fact dead, completely automatic. MDM and monitoring software can help you seek out zombie phones and eliminate them. If your organization has over 500 mobile devices, a mobile device management solution can pay for itself like it did for the bio-tech firm who saved $70,000/year. Learn more about mobile device management or contact us to organize, manage and secure the mobile devices within your organization. Have Questions About MDM or Another IT Related Issue? Don’t be scared, put us to the test! There is NO obligation and NO commitment required for our No-Fee, 100% Free Network Discovery.